Australia’s native dung beetles which evolved with the marsupials, were not adapted to use and disperse cattle dung effectively, causing several problems. Cow dung is a major breeding ground for the buffalo fly, the native bush fly and four species of biting midges, some of which are known vectors of diseases such as ephemeral fever. Dung fouls pasture, obstructing plant growth and promoting rank unpalatable growth around the edge of dung pats. Dung also immobilises plant nutrients in undecomposed dung pats, retarding the recycling process. In the late 1950s George Bornemissza, suggested that foreign dung beetles could usefully be imported into Australia and led the subsequent research program at the Division of Entomology in Canberra. Between 1967 and 1982, CSIRO imported 55 species of dung beetles for release in Australia. Of these, 37 were intended for summer rainfall regions of Northern Australia. Eight species were reared in insufficient numbers, but the remaining 29 species were liberated in at least one locality in Northern Australia; of these 22 originated from southern Africa. It has been described as one of the greatest stories of Australian science because of its impact on sustainable agriculture. When the beetles bring dung down into tunnels, they are putting down fertiliser as well as creating holes and tunnels that help with water penetration when it rains. The disposal of dung reduces flies and breaks the parasite cycle. For every litre of dung that’s taken down, a litre of subsoil is brought to the surface. When the beetles have left after about three or four weeks, the earthworms move in and move down the tunnels, eating the dung and filling the tunnels with loosely packed earth worm casts thus replacing the need for fertiliser. It is an amazingly efficient system now being continued by land-care groups in Australia. Throughout the Mediterranean area and Africa, nature had developed a refined waste-disposal system operated by a wide variety of dung-burying beetles. These insects, ranging from the fearsome Heliocopris gigas, as big as a golf ball, to midgets no bigger than a pea, squeeze nutritious juices from cattle dung for their food and use the residue to form dung balls in which their eggs can hatch. In Australia about 250 kinds of scarab beetle busy themselves in similar cleaning-up operations on the dung left by native animals. But even the largest kangaroos leave only small, dry and fibrous pellets. The moister and much larger pads of imported cattle are a different problem. Only a few of the native beetles attack them effectively and then only at certain times of the year. So, as the cattle population has grown and spread, its dung fallout has become a serious concern. Cow pads dry on the ground to hard cakes and can remain for many months, even years, until they disintegrate. The average adult cow drops 12 dung pads every day. If the pads are not disposed of, they may cover up to several per cent of the grazing area. Moreover, an area of rank pasture will grow around the edge of each cow pad. Cattle tend to avoid this unless ravenous. A quick calculation shows that the 30 million cattle in Australia, producing 300 million cow pads a day, could be spoiling more than a million hectares of grazing land each year. In addition, the unburied dung is an important breeding ground for several flies, particularly the pestiferous bush fly that so impairs the quality of outdoor living throughout much of Australia during summer. In October 1951, while working with the Zoology Department of the University of Western Australia, a Hungarian-born entomologist named George Bornemissza collected beetles at Northam, east of Perth. Bornemissza had been in Australia only nine months and the first thing that struck him out in the field was the quantity of old cow pads and the apparent absence of dung beetles. This was something he had never seen in Europe. The thought stuck like a burr in his mind and he continued making observations after joining CSIRO three years later. In the late 1950s his suggestion that foreign dung beetles could usefully be imported into Australia was taken up by the Division of Entomology in Canberra. So began a remarkable program to correct a balance of nature that was first disturbed nearly 200 years ago when the first English settlers landed five cows and two bulls on Australian soil. The Dung beetle’s breeding cycle begins on the fresh dung pat. Dung beetle fauna are comprised of two basic groups of species: small dung ball rollers and small tunnellers. The former fashion balls of dung in the pat and roll them some distance away, where they are either buried or stowed in the base of vegetation. The tunnellers work entirely within the dung pat, digging tunnels in the soil and packing them with dung masses called brood balls. 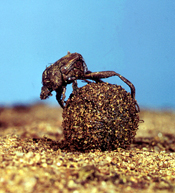 In both cases eggs are laid in the dung balls and develop through larval and pupal stages within them before hatching as young adult beetles. In 1966 a pilot project commenced to import foreign dung beetles into northern Australia to assess prospects for the biological control of dung in this region. George Bornemissza travelled to Hawaii, where several foreign dung beetles were already established, products of an earlier and similar plan to rid the islands of the horn fly. The Hawaiians had earlier brought in dung beetles from different parts of the world, including Africa and Mexico. Seven species of dung beetles were selected and shipped to Australia from Hawaii. They were reared in quarantine in Canberra and then five species were mass-reared for general release. None of the larger species of ball rollers or tunnellers, which cause such spectacular dung removal in Africa, were released in Australia, mainly due to breeding problems. The cattlemen of Queensland were surprisingly polite in the circumstances. From April 1967, CSIRO teams began knocking on homestead doors saying they had brought boxes of beetles to bury the cow pads on their properties. Not a single cattleman succumbed to derisory comment and only one complained. A studmaster near Ayr said he used cow pads to prop up his irrigation pipes. Now, he supposed, he would have to heft around blocks of wood. The first large-scale release of dung beetles by CSIRO in 1967 was followed by others and over the next three summers. In all a total of 275 000 beetles of four species were let loose, mainly between Broome in Western Australia and Townsville in Queensland. The little Onthophagus gazella made extraordinary progress and caused spectacular dung dispersal, colonising an area 400 kilometres by 80 kilometres in just two years. Two other species also became established. The combined effect of these developments excited much interest and enthusiasm among cattlemen and there was a move to fund a further project, based in South Africa, to import a range of dung beetles for different climatic areas of Australia. Other African species subsequently spread through southern Queensland and northern New South Wales, making short work of clearing pad-spoiled pastures in summer when conditions weren’t too dry. In mid-1970 George Bornemissza travelled to South Africa to set up a research unit in Pretoria for a dung beetle introduction project funded by CSIRO and the Australian Meat Research Committee. There followed almost a decade of work selecting and collecting beetles for shipment to Australia. Matters at the Australian end were co-ordinated in Canberra, where the quarantine and mass breeding work occurred. Consignments of the new beetles were shipped from Canberra to pre-arranged collaborators around Australia. Two small dung beetle research groups were established in Australia to bring a focus to introduced beetles in different climatic areas: one at Rockhampton, charged with evaluating the effectiveness of the beetles in this summer rainfall area, and the other in Perth, with a winter-rainfall Mediterranean climate. Another small group was established at Montpellier in southern France, as a base for collection of European beetles for southern Australia. Between 1967 and 1982, CSIRO imported 55 species of dung beetles for release in Australia. Of these, 37 were intended for summer rainfall regions of Northern Australia. Eight species were reared in insufficient numbers, but the remaining 29 species were liberated in at least one locality in Northern Australia; 22 of these originated from southern Africa. Eight species are now well established and widespread in Queensland. Two of these, Onthophagus gazella and Euoniticellus intermedius, were considered to have reached their limits of distribution years ago, extending over most of Northern Australia. The activity of dung beetles disturbs and buries fly breeding sites and recycles nutrients into the soil. It also releases the nutrients locked up in the dung pads and returns them to the ground. This action increases water penetration into soil, which reduces run-off and increases root penetration and soil aeration. Around Australia the good work of collection and redistribution continues through people such as Landcare groups [external link], farmers and individuals with a passion for the beetles. McKay A, 1976, ‘The industrious dung beetle, Surprise and Enterprise: fifty years of science for Australia’s CSIRO’, White F, Kimpton D (eds), CSIRO Publishing, pp.8-9.